3M(TM) Aluminum Foil Tape 427, Linered version of Tape 425, dead-soft aluminum foil backing, excellent heat and light reflection to protect against high temperatures and U.V. degradation. The foil also serves as an excellent barrier against moisture, dust, flame, and certain chemicals as used in aircraft paint stripping masking. Acrylic adhesive supplies superior temperature, U.V. and solvent resistance. It provides excellent age life and is ideal for harsh, long-term outdoor environments. Linered version for applications requiring die cutting. Meets F.A.R 25.853(a), UL 723 Class L and UL 746C. 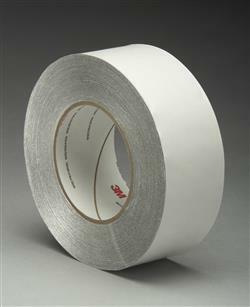 Jaco Aerospace and Industrial is your one stop resource for 3M(TM) Aluminum Foil Tape 427, linered version of Tape 425, Dead-soft aluminum foil backing with a pressure sensitive acrylic adhesive and all of your 3M Products, Tapes, aerospace and industrial needs.